Laborers, legislators, industry officials and Mayor Bill de Blasio's administration came out in opposing camps Friday during a marathon hearing on a "waste equity" that's making its second go-round in the City Council. While the solid-waste industry and its labor unions are often at odds about work rules and wages, both agree a City Council bill designed to reduce how much material a transfer station can receive is a really bad idea. Waste-to-energy firm Covanta Energy Corp. and Clean Energy Fuels Corp. opened a compressed natural gas (CNG) fueling station in Newark, N.J., to serve waste and recycling trucks in northern New Jersey and New York City. As we feast, give gifts, decorate and travel during holiday season, we also consume lots of resources and generate lots of waste. The amount of household garbage in the United States can increase by 25 percent between Thanksgiving and New Year's Day, from 4 million tons to 5 million tons. Almost half of London boroughs are recycling less domestic waste, latest figures show. Younger Americans are less likely to recycle and be green than older age groups, according to a new survey. Recycling and schools are a natural fit. Schools have large numbers of people generating lots of waste—much which is recyclable. 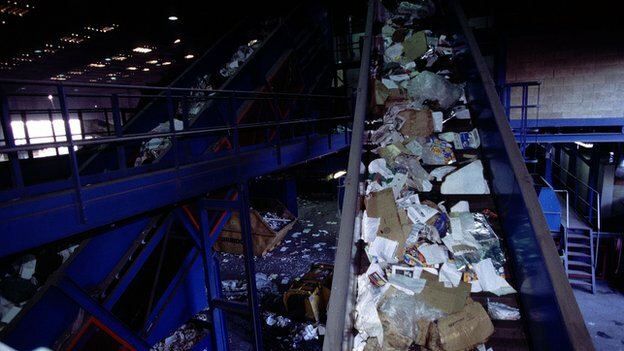 Environmentally, recycling reduces the amount of waste heading to landfills and incinerators. Additionally, recycling can reduce carbon emission and conserve natural resources. Economically, a school may be able to reduce the volume of waste they need to dispose of resulting in a reduction in the size or quantity of waste collection containers and service. New York City’s proposal to replace existing waste transfer stations with a new marine transfer station will triple the cost of waste management for the city, according to the city’s Independent Budget Office (IBO). Oh, yeah? Prove it!” That’s what the Federal Trade Commission (FTC) wants from companies whose products or packaging purport to confer planet-friendly benefits. New York City has launched a campaign to help residents unsubscribe from unwanted mail waste to their homes. Aluminum cans were recycled at a rate of 66.7 percent in 2013, remaining the most recycled beverage packaging type in the United States, according to a new report. New York Gov. Andrew Cuomo has signed into law a producer responsibility law for the collection of mercury thermostats. The Mercury Thermostat Collection Act requires that manufacturers develop and implement a thermostat collection program that meets a pre-established goal of collecting 15,500 thermostats by 2015, according to a news release from the Boston-based Product Stewardship Institute. We were pleased to welcome Council Member Antonio Reynoso at our optical sorter recycling center in the Bronx. We further appreciate the note in CM Reynoso’s newsletter. In the U.S. “sustainability” is a growing trend amongst many businesses. Corporate sustainability maintains the focus on profit maximization, but also takes into account other key factors such as environmental protection and development. With millions of thriving businesses in the U.S., the consequences of the way these enterprises conduct business must be taken into consideration. Earlier last month myself and a few of my colleagues participated in an NYC Parks Activity event alongside students from the Lou Gehrig Middle School IS151 in the Bronx. We helped clean up a park by pulling a specific kind of weed called a mustard weed. All of the students appeared to enjoy the activity, as did all of us at Action. Americans Think They Are Recycling Correctly But Are They Really? Recycling provides many opportunities along with many challenges. I have an optimistic view that most people make a genuine effort to recycle. Surprisingly, one of the biggest challenges in the recycling industry isn't the effort of the people, it's overenthusiastic attempts to actually recycle the un-recyclable. We hope you are enjoying the much anticipated warm weather like we are. In light of spring and showing gratitude we wanted to let you know what we are doing as a company this week and invite you to do the same. Our corporate culture always incorporates participation whether it be our participation in the community or internally within our own offices. On February 2, 2014, MetLife Stadium in East Rutherford, New Jersey, will host Super Bowl XLVIII. To celebrate, New York City, the Super Bowl Host Committee and GMC have dreamed up "Super Bowl Boulevard," a series of football-themed experiences that will take over Times Square the week before the big game. Stop by a live concert, snap a photo with the Vince Lombardi Trophy or race down a specially made toboggan. Admission is FREE and open to the public. FOX, NFL Network, CBS, CNN and ESPN will broadcast the festivities live.